An officer is a member of an armed forces or uniformed service who holds a position of authority. 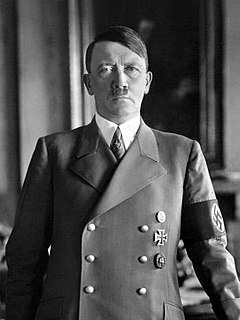 Adolf Hitler was a German politician and leader of the Nazi Party. He rose to power as Chancellor of Germany in 1933 and later Führer in 1934. During his dictatorship from 1933 to 1945, he initiated World War II in Europe by invading Poland in September 1939. He was closely involved in military operations throughout the war and was central to the perpetration of the Holocaust. Benito Amilcare Andrea Mussolini was an Italian politician and journalist who was the leader of the National Fascist Party. He ruled Italy as Prime Minister from 1922 to 1943; he constitutionally led the country until 1925, when he dropped the pretense of democracy and established a dictatorship. Army Alan Brooke Field Marshal Knight of the Garter. Served as CIGS. Bernard Montgomery Field Marshal Knight of the Garter. Served as CIGS, and deputy leader of NATO. Harold Alexander Field Marshal Knight Grand Cross of the Most Honourable Order of the Bath Governor General of Canada. Archibald Wavell Field Marshal Knight Grand Cross of the Order of the Bath Viceroy of India, returned to England in 1947 and became High Steward of Colchester. Viscount Gort Field Marshal Holder of the Victoria Cross. Died in 1946. Assisted Charles Portal in the strategic bombing campaign against Germany. Hugh Dowding Air Chief Marshal Knight Grand Cross of the Order of the Bath Dismissed as head of fighter command in November 1940. Became a theosophist after the war. Died in February 1970, aged 87 and buried in Westminster Abbey. Leader in World War I of an RFC Squadron. Commander of the Battle of Britain. Deservedly credited with saving Britain from defeat. Navy Andrew Cunningham Admiral of the Fleet Knight of the Thistle Served as Lord High Commissioner to the General Assembly of the Church of Scotland. Died in June 1963, buried at sea off Portsmouth. Louis Mountbatten Admiral of the Fleet Knight of the Garter Viceroy of India until 1947. First Sea Lord from 1954 to 1957. Sir Alfred Pound Admiral of the Fleet Knight Grand Cross of the Order of the Bath Died of illness, October 1943. Army Charles de Gaulle Général de Brigade Grand Master Legion of Honor Took control of France as President and was instrumental in creating the Fifth French Republic. Jean de Lattre de Tassigny Marshal of France Grand Master Legion of Honor Later commanded French troops in the First Indochina War. Alphonse Juin Marshal of France Grand Cross Legion of Honor Became Resident General in Morocco. Maurice Gamelin Général d'Armée Grand Cross Legion of Honor Died in 1958. Maxime Weygand Général d'armée Grand Cross Legion of Honor Arrested on charges of treason but acquitted. French Navy François Darlan Admiral of the Fleet War Cross Murdered by Bonnier de La Chapelle December 1942. Army George Marshall General of the Army Distinguished Service Medal, Silver Star As Secretary of State his name was given to the Marshall Plan, for which he was awarded the Nobel Peace Prize in 1953. Dwight D. Eisenhower General of the Army Distinguished Service Cross, Medal of Honor (offered, but not accepted by him). After liberating Europe, served as NATO head and president of Columbia University before being elected the 34th President of the United States. Entered the war as an assistant to the more senior Officers MacArthur and George Patton, showed his worth as a commander during the North Africa Campaign. In December 1943, President Roosevelt decided that Eisenhower—not Marshall—would be Supreme Allied Commander in Europe. The following month, he resumed command of European Theater of Operations United States Army (ETOUSA) and the following month was officially designated as the Supreme Allied Commander of the Supreme Headquarters Allied Powers Europe (SHAPE), serving in a dual role until the end of hostilities in Europe in May 1945. He was charged in these positions with planning and carrying out the Allied assault on the coast of Normandy in June 1944 under the code name Operation Overlord, to head the liberation of Europe on the Western Front and the invasion of Germany. Douglas MacArthur General of the Army Medal of Honor, Philippine Medal of Valor Tasked with rebuilding Japan after the war. Later involved in the Korean War. Recalled from retirement prior to the start of the Pacific war. Early on in World War II, received the Medal of Honor for extreme bravery. Was disappointed to relinquish the Philippines to the Japanese. Promising to return, he did so in 1945 and whilst in Manila, prepared for war in Japan itself. MacArthur presided over the Japanese Unconditional Surrender in 1945. His strategy of maneuver, air strikes and force avoidance meant that soldiers under his command faced relatively low casualties. George S. Patton, Jr. General Distinguished Service Cross Died in a road accident 4 months after the end of the war. Navy Ernest King Fleet Admiral Navy Cross Retired on December 15, 1945. United States Chief of Naval Operations. Chester W. Nimitz Fleet Admiral Legion of Honour, Distinguished Service Medal Served as Chief of Naval Operations. William Halsey, Jr. Fleet Admiral Navy Cross Retired 1947. Frank Jack Fletcher Admiral Medal of Honor Chairman of the General Board, retired in 1947. Raymond A. Spruance Admiral Navy Cross Served as President of the Naval War College. Commander of two of the most significant battles of the war, Battle of Midway and the Battle of the Philippine Sea. Ira C. Eaker General Distinguished Service Medal (Army, Navy and Air Force) Became deputy commander of the Army Air Forces until retirement in 1947. Carl Spaatz General Air Force Cross Replaced Arnold in September 1947 to become chief of the US Air Force. Boris Shaposhnikov Marshal of the Soviet Union Three Orders of Lenin Commandant of the Voroshilov Military Academy. Died in 1945. Chief of the General Staff 1937-1940, 1941-1942. Organized pre-war buildup of the Red Army. Bagramyan's experience in military planning as a chief of staff allowed him to distinguish himself as a capable commander in the early stages of the Soviet counter-offensives against Nazi Germany. Nikolai Vatutin General of the Army Hero of the Soviet Union Killed by the Ukrainian Insurgent Army. Ivan Konev Marshal of the Soviet Union Order of Victory, Hero of the Soviet Union Appointed head of the Soviet forces in East Germany. Served as chief of the Soviet Armed Forces and Warsaw Pact. Defence Commissar till 19 July 1941. Chairman of the Stavka (Soviet High Command). A capable commander in the early stages of World War II. Played a decisive role in the Winter War and the invasion of Poland. After the disaster at Kharkov, Timoshenko was removed by Stalin from front-line command but given overall commanders in different fronts of the USSR. Soviet Navy Ivan Isakov Admiral of the Fleet of the Soviet Union Hero of the Soviet Union Commander-in-Chief of the Naval Forces. Army Chiang Kai-shek Generalissimo Order of National Glory After the war against Japan, resumed Chinese Civil War against the communists. Retreated to Taiwan and led the Kuomintang (KMT) government there until his death. Was both the head of the Republic of China and the supreme Allied commander in the China Theatre. Led the nation to total war from his temporary capital at Chongqing. Mao Zedong Great Leader of Chinese resistance movements Honour Sabre of the Awakened Lion Defeated the Kuomintang in the Chinese Civil War and established the People's Republic of China. Organized Chinese guerrilla resistance in Japanese-held territories. Yan Xishan General Order of Blue Sky and White Sun Fought on the side of the Republic of China in the civil war. Chen Cheng General Order of Blue Sky and White Sun Became the Chief of the general staff. Zhu De Marshal of the People's Republic of China Honour Sabre of the Awakened Lion Became the commander-in-chief of the People's Liberation Army. Military leader of the Communist Eighth Route Army. Xue Yue General Order of Blue Sky and White Sun Fought on the side of the Republic of China in the civil war. Li Zongren General Order of Blue Sky and White Sun Became the Vice President of the Republic of China. Bai Chongxi General Order of Blue Sky and White Sun Became the Minister of National Defence of the Republic of China. Sturdee served as the Chief of General Staff and commanded the First Australian Army (1939-1945). On 6 September 1945 he was the senior Allied officer present at the surrender of Japanese Forces in Rabaul in the South West Pacific theatre. On 1 December 1945 Sturdee was appointed Commander in Chief of the Australian Military Forces, overseeing the demobilisation of the wartime army. He was mentioned in despatches for a third time on 6 March 1947. Army Brudenell White General Knight Commander of the Order of the Bath Killed in the Canberra air disaster, 1940. Thomas Blamey General Knight Grand Cross of the Order of the British Empire Promoted to Field Marshal in 1950. Became an author and promoted welfare of ex-servicemen. Commander-in-chief of Australian Armed Forces and commander-in-chief of Allied Land Forces in the South West Pacific Area. Edmund Herring Lieutenant General Knight Commander of the Order of the British Empire Later Chief Justice of Australia. Received KCMG in 1949. Commander of Australian forces in the Kokoda Track campaign. Leslie Morshead Lieutenant General Knight Commander of the Order of the Bath Became General Manager of the Orient Steam Navigation Company. Led the famous Australia defence against Rommel's in siege of Tobruk. Commander at the Battle of El Alamein. Australia forces took 22 percent of the casualties there. After learning the art of jungle warfare, was a very competent commander of operations against the Japanese in New Guinea. Air Force Charles Burnett Air Chief Marshal Knight Commander of the Order of the Bath RAF officer loaned to Australia and served as Chief of the Air Staff from 1940 to 1942. Oversaw a 20-fold increase in the size of the RAAF which supported the Empire Air Training Scheme. Returned to Great Britain in 1942 and while suffering poor health worked in the RAF's cadet organisation, the Air Training Corps. Died of a coronary thrombosis months before the end of the War. Fighter ace during the First World War. Deputy Commander of RAF in the Middle East. Air Force Peter Roy Maxwell Drummond Air Marshal Knight Commander of the Order of the Bath Died in an air crash at sea, 1945. Navy John Gregory Crace Vice Admiral Knight Commander of the Order of the British Empire Commanded Chatham Dockyard in Britain. Commanded the Australian navy in the Battle of the Coral Sea. Commander of the Allied Naval Squadron, ANZAC Force. Air Force Arthur Coningham Air Marshal Knight Commander of the Order of the Bath Missing in Bermuda Triangle. A high scoring air ace in World War I. Air force Commander working with famous Major General George Patton during Operation Torch. Commander of tactical Air Forces for Operation Husky and D-Day. Keith Park Air Chief Marshal Knight Grand Cross of the Order of the Bath Returned to New Zealand. A veteran of World War I and air ace. Served under Hugh Dowding and commanded the defense of London during the Luftwaffe attacks. Dowding and Park are credited with winning the Battle of Britain. Led the defense of Malta. Served in the Royal Naval Air Service during the First World War. Commander of Northern Ireland RAF. Bomber Command Commander 4 Group. Deputy Chief of Staff (Air), SHAEF. Army Edward Rydz-Śmigły Marshal of Poland Order of the White Eagle Suffered heart attack before he could participate in the Polish resistance. Władysław Sikorski General Order of the White Eagle Died in plane crash July 1943. Władysław Anders General Order of the White Eagle Became Inspector-General of the Polish Armed Forces in Exile. Tadeusz Bór-Komorowski Lieutenant General Order of the White Eagle Elected Prime Minister of Polish government in Exile. He was one of the officers of the Polish Legion against the Soviets. Army Ludvík Svoboda General People's Hero of Yugoslavia, Hero of the Soviet Union Later president of the Czechoslovak Socialist Republic. Ján Golian Brigadier General Czechoslovak War Cross Executed by the Germans in a concentration camp in Flossenburg. Led the insurgent Slovak Army during the Slovak National Uprising. Army Alexander Papagos Field Marshal the Commander's Cross of the Cross of Valour Deported to Dachau Concentration Camp, led Greek army in Greek Civil War, later Field Marshal and Prime Minister of Greece. Major of Artillery (assumed rank) Committed suicide after the Second World War. Founder and chief leader of the Greek People's Liberation Army (ELAS). Stefanos Sarafis Major General Later MP for the United Democratic Left, died in a car accident in 1957. Chief military officer of the Greek People's Liberation Army after April 1943. Napoleon Zervas Lieutenant Colonel Twice minister, died in 1957. Commander of the National Republican Greek League resistance army. Navy Alexandros Sakellariou Vice Admiral the Commander's Cross of the Cross of Valour MP, Navy and National Defense Minister after the war. Died in 1982. Army Henri Winkelman General Military William Order Died in 1952. Hein ter Poorten Lieutenant General He spent the rest of the war in various prisoner of war camps, and in 1945 returned to the Netherlands. Died in 1968. Commander of the ABDA land forces in early 1942. Navy Conrad Helfrich Vice Admiral Knight Grand Cross of the Order of the Netherlands Lion Died in 1962. Commander of the ABDA Naval forces in 1942. Karel Doorman Rear admiral Knight of the Military William Order Died in Battle of the Java Sea. Army Draža Mihailović General of the Army Legion of Merit Executed by Communists in 1946. Army Harry Crerar General Order of the Companions of Honour Became a diplomat, postings in Czechoslovakia, Netherlands and Japan. Army Wilhelm Keitel Field Marshal Knight's Cross of the Iron Cross Executed in 1946. Alfred Jodl Colonel General Knight's Cross of the Iron Cross Executed in 1946. Heinrich Himmler Reichsführer-SS Blood Order, Golden Nazi Party Chief of the SS during World War II. Suicide, 1945. Military commander and a leading member of the Nazi Party (NSDAP) of Nazi Germany. Nazi leader Adolf Hitler later appointed him Commander of the Replacement (Home) Army and General Plenipotentiary for the administration of the entire Third Reich. Himmler was one of the most powerful men in Nazi Germany and one of the persons most directly responsible for the Holocaust. Walther von Brauchitsch Field Marshal Knight's Cross of the Iron Cross Died in 1948. Commander-in-Chief of the German Army 1938-1941. Paul Ludwig Ewald von Kleist Field Marshal Knight's Cross with Oak Leaves and Swords Died in 1954 in a Soviet prison. Most senior German officer to die in a Soviet prison. An aristocrat and senior commander in World War I. Commander of tank armies in the German Army in World War II. Fought in most of the actions involving blitzkrieg techniques. Wilhelm Ritter von Leeb Field Marshal Knight's Cross of the Iron Cross Died in 1956. Exemplary service in World War I. Given the command of Army Group North in Operation Barbarossa. Was in charge of the unsuccessful siege of Leningrad, which lasted nearly 1000 days. Gerd von Rundstedt Field Marshal Knight's Cross with Oak Leaves and Swords Died in 1953. Günther von Kluge Field Marshal Knight's Cross with Oak Leaves and Swords Committed suicide in 1944. Georg von Küchler Field Marshal Knight's Cross with Oak Leaves Arrested in 1948 and sent to the Soviet Union by the Americans. Released in 1953. Fedor von Bock Field Marshal Knight's Cross of the Iron Cross Was killed by a British fighter pilot in 1945 and became the only one of two of Adolf Hitler's field marshal's to die from enemy fire. Erich von Manstein Field Marshal Knight's Cross of the Iron Cross with Oakleaves and Swords Imprisoned after war, later released and served as senior advisor to the Bundeswehr. Erwin Rommel Field Marshal Pour le Mérite, Knight's Cross of the Iron Cross with Oakleaves, Swords and Diamonds Committed suicide after being implicated in the Valkyrie plot. Official cause of death by the State was succumbing to wounds from an Allied air attack. Walter Model Field Marshal Knight's Cross of the Iron Cross with Oakleaves, Swords and Diamonds Committed suicide in 1945. Heinz Guderian Colonel General Knight's Cross of the Iron Cross with Oak Leaves Died in 1954. Friedrich Paulus Field Marshal Knight's Cross of the Iron Cross with Oak Leaves Soviet captivity until 1953. Became a vocal critic of the Nazi regime. Commander of the disastrous campaign in the Battle of Stalingrad. Josef Dietrich SS-Oberst-Gruppenführer Knight's Cross of the Iron Cross with Oakleaves, Swords and Diamonds Sentenced to life, reduced to 25 years imprisonment in 1946. Promoted welfare of ex-servicemen on release. Air force Hermann Göring Reichsmarschall Grand Cross of the Iron Cross Committed suicide after being sentenced to death for war crimes. Albert Kesselring Field Marshal Knight's Cross of the Iron Cross with Oakleaves, Swords and Diamonds Died in 1960 at the age of 75. Wolfram Freiherr von Richthofen Field Marshal Knight's Cross of the Iron Cross with Oak Leaves Died in 1945. Robert Ritter von Greim Field Marshal Knight's Cross of the Iron Cross with Oakleaves, Swords and Diamonds Committed suicide in 1945. Kurt Student General Knight's Cross of the Iron Cross with Oakleaves Held as a Prisoner of War by the British and freed in 1948. Navy Erich Raeder Grand Admiral Knight's Cross of the Iron Cross Died in 1960. Karl Dönitz Grand Admiral Knight's Cross of the Iron Cross with Oak Leaves Briefly became President of Germany. Spent 10 years in prison. Died in 1980. Pietro Badoglio Marshal of Italy Knight of the Supreme Order of the Most Holy Annunciation Succeeded Mussolini and arranged an Armistice of his country with the Allies. Died in 1956 of natural causes (Cardiac asthma). Rodolfo Graziani Marshal of Italy Knight Grand Cross of the Order of Saints Maurice and Lazarus Graziani was sentenced to 19 years in jail but only 4 months were served. Died in 1955. Viceroy of Italian East Africa, Governor-General of Italian Libya, Minister of Defense of RSI. Ugo Cavallero Marshal of Italy Knight's Cross of the Iron Cross Committed suicide in 1943 after alienating both Germany and non-fascist Italy. Giovanni Messe Marshal of Italy Grand Officer of the Military Order of Savoy Became a member of the Italian Senate. Died in 1968. Ettore Bastico Marshal of Italy Knight Grand Cross of the Order of Merit of the Italian Republic Marshal of Italy and high rank officer during North Africa Campaign. Died in 1972. Governor of the Italian Aegean Islands and Libya. Mario Roatta General Silver Medal of Military Valor (3) Removed from service by Badoglio in 1943 under Allies' request. He later fled to Spain living under protection of Francisco Franco. In Italy he was sentenced in absentia to life imprisonment but his sentence was overturned in 1948. Died in 1968. General of the Italian Second Army known for his cruelty against civilians in the Italian-occupied Yugoslavia and for the deportation of many Slavs to the Rab concentration camp. Alfredo Guzzoni General Commander of the Order of Saints Maurice and Lazarus Died in 1965. Commander-in-Chief of Army Group Liguria. Vittorio Ambrosio General Commander of the Military Order of Savoy Was Chief of Staff of the Italian Army. Was demoted to Inspector-General of Army by Badoglio because the Allies didn't trust him. Died in 1958. Served an instrumental role in the fall of Benito Mussolini and the shattering of the alliance between Italy and Germany. Giuseppe Castellano General Bronze Medal of Military Valor Negotiated the armistice between Italy and the Allied armed forces in September 1943. Died in 1977. Emilio de Bono Marshal of Italy Knight of the Supreme Order of the Most Holy Annunciation He was one of the members of the Fascist Grand Council who voted oust Benito Mussolini. After Mussolini was put in charge of the Italian Social Republic, de Bono was sentenced to death after the Verona trial in 1944. Navy Arturo Riccardi Admiral Grand Officer of the Order of Saints Maurice and Lazarus Removed from office by Badoglio. Died in 1966. Served as Chief of staff of the Italian Navy. Angelo Iachino Admiral Grand Officer of the Order of the Crown of Italy Died in 1976. Known for his neofascist activism in post-war Italy and for the Golpe Borghese. Inigo Campioni Admiral Grand Officer of the Order of Saints Maurice and Lazarus Executed by a firing squad at Parma on 24 May 1944 after being convicted of high treason by the military tribunal of the Italian Social Republic. Giuseppe Fioravanzo Admiral Military Order of Italy Died in 1975. Alberto Da Zara Admiral Military Order of Italy Died in 1951. Air Force Italo Balbo Marshal of the Air Force Knight Grand Cross of the Order of Saints Maurice and Lazarus Killed by friendly fire over Tobruk in 1940. Governor-General of Libya, Commander-in-Chief of Italian North Africa. Rino Corso Fougier Chief of Staff of the Italian Air Force Knight Grand Cross of the Order of Saints Maurice and Lazarus Served as the commander of the Corpo Aereo Italiano. Served as the Chief of Staff of the Italian Air Force between 1941 and 1943. Died in 1963. Commanded the Regia Aeronautica between 1941 and 1943. Army Hideki Tojo General Order of the Rising Sun Executed in 1948. Hajime Sugiyama Field Marshal Order of the Rising Sun Committed suicide shortly after the end of the war. Hisaichi Terauchi Field Marshal Order of the Rising Sun Died in a prisoner of war camp in Malaya June 1946. Son of former PM Terauchi Masatake, became the senior officer of the Imperial Japanese after the coup of 1936. Was at one time considered as Tojo successor after the latter's resignation. Shunroku Hata Field Marshal Order of the Rising Sun Sentenced to imprisonment. Commanded the Second General Army, based in Hiroshima from 1944 to 1945 in preparation for the anticipated Allied invasion of the Japanese home islands. Tomoyuki Yamashita General Order of the Rising Sun Executed at 1946. Iwane Matsui General Order of the Rising Sun Retired 1938, executed in 1948. Arrested by the American occupation authorities after the surrender of Japan, Matsui was charged with war crimes in connection with the actions of the Japanese army in China also known as The Nanking Massacre. In 1948, the International Military Tribunal for the Far East (IMTFE) found him guilty of class B and C war crimes, and he was hanged that December at Sugamo Prison, alongside six others, including Hideki Tojo. He was 70 at the time of his death. Navy Osami Nagano Fleet Admiral Order of the Rising Sun Died of a heart attack in 1947. Chief of the Navy General Staff, 1941-1944. Prince Fushimi Hiroyasu Fleet Admiral Order of the Chrysanthemum Died in 1946. Chief of staff of the Navy, 1932-1941. Isoroku Yamamoto Fleet Admiral Order of the Chrysanthemum The plane carrying him was shot down in 1943. Mineichi Koga Fleet Admiral Order of the Rising Sun Killed in plane crash 1944. Soemu Toyoda Admiral Order of the Rising Sun Died in 1957 at the age of 73. Chūichi Nagumo Admiral Order of the Rising Sun Committed suicide in 1944 during the battle of Saipan. Jisaburō Ozawa Vice Admiral Order of the Sacred Treasure Died in 1966. Army Gusztáv Jány Colonel General Knight's Cross of the Iron Cross Sentenced to death in 1947. Commanders of the Hungarian Second Army at Battle of Stalingrad. Dezső László Colonel General Knight's Cross of the Iron Cross Sentenced to death in 1949. Géza Lakatos Colonel General Knight's Cross of the Iron Cross Died in 1967, Australia at the age of 77. Was a colonel general in the Hungarian Army during World War II who served briefly as Prime Minister of Hungary, under governor Miklós Horthy from 29 August 1944, until 15 October 1944. Ferenc Szombathelyi Colonel General Order of Merit of the Kingdom of Hungary Died in 1946. Served as Chief of Army Staff of the Royal Hungarian Army. Ferenc Feketehalmy-Czeydner Colonel General Order of Merit of the Kingdom of Hungary Died in 1946. Had a significant role in the Novi Sad massacre. Béla Miklós Colonel General Order of Vitéz Died in 1948. Commanded the Hungarian First Army. He supported leaving the Axis powers and joining the Red Army. Army Plaek Phibunsongkhram Field Marshal Order of the Nine Gems Later ousted after the defeat of the Japanese, only to return to power in 1948 and become Prime Minister until 1957. Prime Minister and dictator of Thailand during the war, eventually commanding Thai forces during the French-Thai War. Jarun Rattanakun Seriroengrit Lieutenant general Order of the Crown of Thailand Commander of an infantry battalion and took part in the invasion and occupation of the Shan States in Burma. Commander of Phayap Army during the Pacific War. Army Ion Antonescu Marshal of Romania Order of Michael the Brave Executed in 1946. Petre Dumitrescu General Knight's Cross of the Iron Cross with Oak Leaves Died in 1950 after a bout with cancer. Commanded the Romanian First Army between 1940 and 1941. Commanded the Romanian Third Army between 1941 and 1944. Constantin Constantinescu-Claps General Order of Michael the Brave Died in 1961. Commanded the Romanian Fourth Army between 1941 and 1943. Gheorghe Avramescu General German Cross in Gold Died in 1945. Commanded the Romanian Mountain Corps between 1941 and 1943. Commanded the Romanian Fourth Army between 1944 and 1945. Ioan Mihail Racoviță General Order of Michael the Brave Died in 1954. Commanded the Romanian Cavalry Corps between 1941 and 1943. Commanded the Romanian Mechanized Troops between 1943 and 1944. Vasile Atanasiu General Order of the White Lion Died in 1964. Commanded the 3rd Army Corps in the liberation of Bessarabia, the battle for the beachhead of Albiţa on the Prut River, the advance to the Dniester at Tiraspol between 1941 and 1943. Commanded the Romanian First Army in 1945, in the battles on the Czechoslovakian front in the Javorina, between the rivers Hron and Morava and thereafter in Bohemia. Mihail Lascăr General Knight's Cross of the Iron Cross with Oak Leaves Died in 1959. Commanded the 1st Mixed Mountain Brigade, an elite unit of the Romanian Third Army between 1941 and 1942. Commanded the 6th Division of the Romanian Third Army in 1942. Was taken prisoner at the Battle of Stalingrad and became commander of the Romanian Fourth Army in 1945. Constantin Sănătescu General Died in 1948. Commanded the 4th Army Corps between 1941 and 1943. Commanded the Romanian Fourth Army between 1943 and 1944. Major participant in King Michael's Coup of 1944. Constantin Nicolescu Lieutenant General Order of Michael the Brave Died in 1972. Commanded the of Bucharest Military between 1941 and 1943. Commanded the 4th Army Corps between 1943 and 1944. Was among the generals who prepared the King Michael Coup, and from November 1944 until the abolition of the monarchy in December 1947 served as head of the royal household. Corneliu Dragalina Lieutenant General Knight's Cross of the Iron Cross Died in 1949. Commanded the 6th Army Corps between 1940 and 1943. Ioan Dumitrache Major General Knight's Cross of the Iron Cross Died in 1977. Commanded the 2nd Mountain Division between 1942 and 1944. Was promoted to major general in 1944 and commanded the Romanian Mountain Corps. Gheorghe Manoliu Major General Knight's Cross of the Iron Cross Died in 1974. Commanded the 4th Mountain Division between 1940 and 1942. Was promoted to major general in 1943 and commanded the 4th Army Corps. Emanoil Bârzotescu Major General Order of the Crown (Romania) Died in 1968. Commanded the 1st Infantry Division between 1940 and 1942. Retired in 1942 and was recalled in 1945. Commanded the 6th Crops Area in 1945. Dumitru Dămăceanu Brigadier General Order of Michael the Brave Died in 1978. Commanded the 10th Cavalry Regiment between 1941 and 1942. Chief of Staff in Bucharest Military between 1942 and 1944. Major participant in King Michael's Coup of 1944. Leonard Mociulschi Brigadier General Knight's Cross of the Iron Cross Died in 1979. Commanded the 1st Mixed Mountain Brigade, an elite unit of the Romanian Third Army between 1940 and 1941. Commanded the 3rd Mixed Mountain Brigade between 1942 and 1943. Corneliu Teodorini Brigadier General Knight's Cross of the Iron Cross with Oak Leaves Died in 1976. Commanded the 6th Cavalry Regiment. Navy Horia Macellariu Rear Admiral Knight's Cross of the Iron Cross Died in 1989. Commanded the Royal Romanian Navy's Black Sea Fleet between 1941 and 1944. Army Ferdinand Čatloš Major General Was briefly imprisoned, set free in 1948, died in 1972. Slovakian Minister of Defence and Chief General Staff. Was one of the most important Finnish generals. II Corps and III Corps of the Finnish ground forces were under his command at the end of the Continuation War. 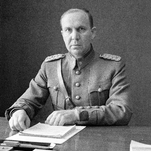 Ruben Lagus Lieutenant General Mannerheim Cross Died in 1959. Commanded the Finnish Armoured Division (Panssaridivisioona) during the Lapland War. Erik Heinrichs General Mannerheim Cross Died in 1965. Commanded the Army of Karelia and the Army of the Isthmus. Vilho Nenonen General Mannerheim Cross Died in 1960. He was extremely influential in the development of the Finnish Army's artillery. The trajectory calculation formulas he developed are still in use today by all modern artillery. Paavo Talvela General Mannerheim Cross Died in 1973. He commanded the Finnish III Corps in the Winter War from February 1940 to the end of the WInter War. Army Aung San Major General Order of the Star of the Revolution Arranged for the establishment of Burmese independence, assassinated under mysterious causes in 1947. Led the Burma National Army and the Anti-Fascist Organisation. General Guisan developed his famous Swiss National Redoubt concept in summer 1940, He made it very clear that Switzerland would resist any Nazi invasion. If they ran out of bullets they were to resort to the bayonet. He said that Switzerland would defend itself against any invader and would never surrender. Indeed, Swiss citizens had been instructed to regard any surrender broadcast as enemy lies and resist to the end. Army Roman Shukhevych General Gold Cross of Combat Merit First Class, the Cross of Merit in gold Died fighting NKVD forces in Lviv in 1950. Supreme commander of the Ukrainian Insurgent Army. The Allied leaders of World War II listed below comprise the important political and military figures who fought for or supported the Allies during World War II. Engaged in total war, they had to adapt to new types of modern warfare, on the military, psychological and economic fronts. 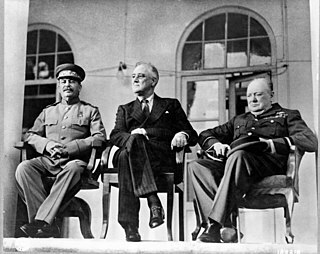 The Axis leaders of World War II were important political and military figures during World War II. The Axis was established with the signing of the Tripartite Pact in 1940 and pursued a strongly militarist and nationalist ideology; with a policy of anti-communism. During the early phase of the war, puppet governments were established in their occupied nations. When the war ended, many of them faced trial for war crimes. The chief leaders were Adolf Hitler of Germany, King Victor Emmanuel III with Benito Mussolini of Italy and Emperor Hirohito with Hideki Tojo of Japan. Unlike what happened with the Allies, there was never a joint meeting of the main Axis heads of government, although Mussolini and Adolf Hitler did meet on a regular basis. The Distinguished Service Medal (DSM) is a military award of the United States Army that is presented to any person who, while serving in any capacity with the United States military, has distinguished himself or herself by exceptionally meritorious service to the Government in a duty of great responsibility. The performance must be such as to merit recognition for service that is clearly exceptional. Exceptional performance of normal duty will not alone justify an award of this decoration. Luxembourg, officially the Grand Duchy of Luxembourg, is a small landlocked country in western Europe. It is bordered by Belgium to the west and north, Germany to the east, and France to the south. Its capital, Luxembourg City, is one of the three official capitals of the European Union and the seat of the European Court of Justice, the highest judicial authority in the EU. Its culture, people, and languages are highly intertwined with its neighbours, making it essentially a mixture of French and German cultures, as evident by the nation's three official languages: French, German, and the national language, Luxembourgish. The repeated invasions by Germany, especially in World War II, resulted in the country's strong will for mediation between France and Germany and, among other things, led to the foundation of the European Union. The Luxembourg Army is the national military force of Luxembourg. The army has been an all-volunteer force since 1967. It has a current strength of approximately 450 professional soldiers—340 enlisted recruits and 100 civilians—with a total budget of $369 million, or 0.9% of GDP. The Belgian Armed Forces is the national military of Belgium. The Belgian Armed Forces was established after Belgium became independent in October 1830. Since that time Belgian armed forces have fought in World War I, World War II, the Cold War, Kosovo, Somalia and Afghanistan. The ParaCommando Brigade intervened several times in Central-Africa, for maintaining public order and evacuation of Belgian citizens. The Armed Forces comprise four branches: the Land Component, the Air Component, the Naval Component and the Medical Component. Belgium is a country in Europe and member of major international organizations like the European Union and NATO which are both headquartered in Brussels, Belgium. The NATO bombing of Yugoslavia was the North Atlantic Treaty Organisation's (NATO) military operation against the Federal Republic of Yugoslavia (FRY) during the Kosovo War. The air strikes lasted from March 24, 1999 to June 10, 1999. The official NATO operation code name was Operation Allied Force; the United States called it "Operation Noble Anvil", while in Yugoslavia, the operation was incorrectly called "Merciful Angel", as a result of a misunderstanding or mistranslation. The bombings continued until an agreement was reached that led to the withdrawal of Yugoslav armed forces from Kosovo, and the establishment of United Nations Interim Administration Mission in Kosovo (UNMIK), a UN peacekeeping mission in Kosovo. Supreme Headquarters Allied Powers Europe (SHAPE) is the headquarters of the North Atlantic Treaty Organization's Allied Command Operations (ACO). Since 1967 it has been located at Casteau, north of the Belgian city of Mons, but it had previously been located, from 1953, at Rocquencourt, next to Versailles, France. From 1951 to 2003, SHAPE was the headquarters of Allied Command Europe (ACE). Since 2003 it has been the headquarters of Allied Command Operations, controlling all NATO operations worldwide. The Distinguished Flying Cross is a military decoration awarded to any officer or enlisted member of the United States Armed Forces who distinguishes himself in support of operations by "heroism or extraordinary achievement while participating in an aerial flight, subsequent to November 11, 1918." No. 1 (F) Squadron is a squadron of the Royal Air Force. It was the first squadron to fly a VTOL aircraft. It currently operates Eurofighter Typhoon aircraft from RAF Lossiemouth. The British Mediterranean Fleet also known as the Mediterranean Station was part of the Royal Navy. The Fleet was one of the most prestigious commands in the navy for the majority of its history, defending the vital sea link between the United Kingdom and the majority of the British Empire in the Eastern Hemisphere. The first Commander-in-Chief for the Mediterranean Fleet was the appointment of General at Sea Robert Blake in September 1654 the Fleet was in existence until 1967. The Allied Joint Force Command Brunssum (JFCBS) is a NATO command at Brunssum, the Netherlands. Operation Althea, formally European Union Force (EUFOR) Bosnia and Herzegovina, is a military deployment in Bosnia and Herzegovina to oversee the military implementation of the Dayton Agreement. It is the successor to NATO's SFOR and IFOR. The transition from SFOR to EUFOR was largely a change of name and commanders: 80% of the troops remained in place. It replaced SFOR on 2 December 2004. The Treaty of Brussels, also referred to as the Brussels Pact, was the founding treaty of the Western Union (WU) between 1948 and 1954, at which it point it was amended as the Modified Brussels Treaty (MTB) and served as the founding treaty of the Western European Union (WEU) until its termination in 2010. The treaty provided for the organisation of military, economic, social and cultural cooperation among member states, as well as a mutual defence clause. 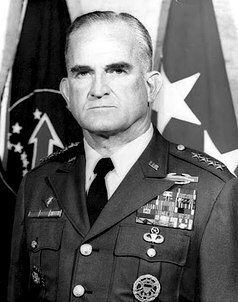 General William Bradford Rosson commanded the U.S. Army, Pacific from October 1970 to January 1973. He was commissioned in 1940 through ROTC and saw combat in World War II, earning the Distinguished Service Cross for valor on the Anzio Beachhead in Italy. He also fought in North Africa, Sicily, France, and Germany. Exercise Grand Slam was an early major naval exercise of the newly formed North Atlantic Treaty Organization (NATO). This 1952 combined naval exercise took place in the Mediterranean Sea, and it included a naval force that was described as being "the largest armada to be assembled in that area since the end of World War II." Exercise Grand Slam was an early test for NATO's Allied Forces Southern Europe. With Exercise Longstep, this exercise served as the prototype for future NATO maritime exercises in the Mediterranean Sea during the Cold War. The Western Union (WU), also referred to as the Brussels Treaty Organisation (BTO), was the European military alliance established between France, the United Kingdom (UK) and the three Benelux countries in September 1948 in order to implement the Treaty of Brussels signed in March the same year. Under this treaty the signatories, referred to as the five powers, agreed to collaborate in the defence ﬁeld as well as in the political, economic and cultural ﬁelds. Operation Unified Protector was a NATO operation in 2011 enforcing United Nations Security Council resolutions 1970 and 1973 concerning the Libyan Civil War and adopted on 26 February and 17 March 2011, respectively. These resolutions imposed sanctions on key members of the Gaddafi government and authorized NATO to implement an arms embargo, a no-fly zone and to use all means necessary, short of foreign occupation, to protect Libyan civilians and civilian populated areas. Exercise Longstep was a ten-day NATO naval exercise held in the Mediterranean Sea during November 1952 under the overall command of Admiral Robert B. Carney, USN, the Commander-in-Chief Allied Forces Southern Europe (CINCAFSOUTH). This exercise involved over 170 warships and 700 aircraft, and it featured a large-scale amphibious assault along the western coast of Turkey. With Exercise Grand Slam, this exercise served as the prototype for future NATO maritime exercises in the Mediterranean Sea during the Cold War. The involvement of the Grand Duchy of Luxembourg in World War II began with its invasion by German forces on 10 May 1940 and lasted beyond its liberation by Allied forces in late 1944 and early 1945. Guillaume "Guill" Konsbruck was a Luxembourgian military officer, politician, and manager of the steel company Arbed. 1 2 3 4 5 6 7 8 9 10 11 12 13 14 15 16 17 18 19 20 21 22 23 24 25 26 27 28 29 30 31 32 33 34 35 36 37 38 39 40 41 42 43 44 45 46 47 48 49 50 51 52 53 54 55 56 57 58 59 60 61 62 63 64 65 66 67 68 69 70 71 72 73 74 75 76 77 78 I.C.B Dear; M.R.D. Foot (2005). Oxford Companion to the Second World War (paperback ed.). Oxford University Press. ISBN 978-0-19-280666-6. ↑ Lord Ismay (2001). NATO, the first 5 years. NATO archives. ↑ "Fleet Admiral Halsey Jr Profile at Naval Historical center" . Retrieved 2007-01-03. ↑ "He fought to the bitter end". ↑ "Décès du Colonel E. Speller, Aide de Camp de S. A. R. Madame la Grande-Duchesse de Luxembourg:" (PDF). Grand Duché de Luxembourg Ministére D'État Bulletin D'Information (in French). 8 (12). Luxembourg: Service information et presse. 29 February 1952. p. 30. ↑ Incerti, Corrado. "Borghese: indigestione o veleno?" (PDF). Retrieved 8 December 2014.